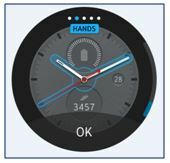 The device uses the Stylise feature where you can customize the Gear S2's watch face. You can format of the watch face hands or font. You can add additional information to be displayed.